Nova Launcher developer Kevin Barry just got done rolling out Google Feed integration, and before we can even catch our breath, there's another significant improvement on the way. In the latest beta of Nova, there's built-in support for Sesame Shortcuts, which is an app of which you probably haven't heard. The gist is Sesame lets Nova deep link into your apps. That's not technically all you get in this update. Here's the full changelog. Sesame supports deep links into about 20 apps including contacts, Netflix, Spotify, and Tasker. 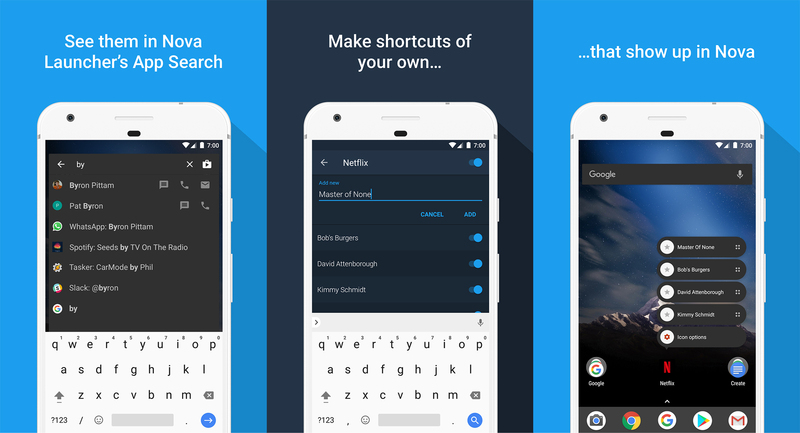 The shortcuts will appear in Nova's app search panel. Just tap a result for one of the supported apps, and you will be taken right to that section of the app. For example, search for a contact, and you can jump right into your current chat thread on WhatsApp. Your shortcuts should also appear as launcher shortcuts on the home screen. This new functionality is free to try for all Nova users, but Sesame is still a separate app—no money has changed hands between the two devs. Sesame has a 14-day trial, and it'll still work after that is over. You'll just get "gentle reminders" to upgrade after using a shortcut. The full version of Sesame is $2.99 via in-app purchase. If you want to give this a shot, you need the Nova v5.4 beta. You can join the beta program, or just grab the new version from APK Mirror. You also need to install Sesame.